This is the 60th anniversary of major league baseball rivalry on the West Coast between the Giants and the Dodgers. 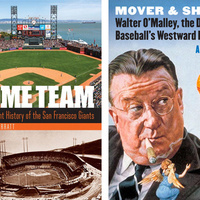 Andy McCue author of Mover and Shaker: Walter O’Malley, the Dodgers and Baseball’s Westward Expansion and Rob Garratt author of Home Team: The Turbulent History of the San Francisco Giants will talk about the teams and the impact they had on California over the years. Garratt used resources from the George Moscone Collection curated at the Holt-Atherton Special Collections and Archives. Book signing following the talk. Hot Dogs and beer will be available for purchase.